This evening, when I got back home, my wife was bottle feeding the baby, and the baby started to hold the bottle using both her hands. 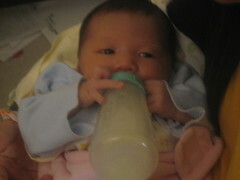 After a while, my wife let her hand loose, and Serenity (Youyang) continued to hold the bottle, and feeding herself. I will post a picture tomorrow. Her feeding self act made all of us laugh for a while. Baby grows very fast, these days she eats a lot, and sometimes just cannot wait to eat when her mom starts to feed her. She probably swallow quite a bit gas in the process. But due to her size (2 weeks old tomorrow), she cannot get rid of the gas easily. Thus we can hear her colic from time to time (refer to Baby Colic from Wiki). I was pretty nervous initially. As I learn more facts, think about it, and learn how to burping, I became more confident. Other than that, she is doing well. Tomorrow, we will take her to see doctor (2 weeks scheduled visit).